Design Addict Mom: Zion’s Homemade Sandbox on Wheels. Zion’s Homemade Sandbox on Wheels. this sandbox on wheels. Many of you preferred this one. And so did i. It’s mobile ability was a major appeal to me since it made it quite flexible. Having decided that this was the one I wanted, I set out to find out more information on how to make it. Just one google search later and voila, I found the instructions on how this exact sandbox was built. The instructions can be found here on Nonchalant Mom(the pic above shows a shot of Nonchalant’s Mom’s home that was being featured in the now defunct Domino magazine). So the hubby got some pretreated wood to build this for me, but as you know, he had to leave (thank you for your support too btw-it’s consoling to know that I have my blog friends ). Anyhoo, he wasn’t able to build it before he left, so Mr S. (a teacher colleague and talented carpenter) came to my rescue. He whipped this baby together in less than two hours. The materials: 2- 1x12 8feet long $14.00 ea, half sheet of 3/4 in plywood $18.00, 4 wheels $4.50 each, screws $4.00 can be found at your local Lowes or Home Depot; really any hardware store should have these items. The wheels also can be locked into place so the sandbox won’t move with Zion in it. In addition, there are tiny holes in the base to ensure that any water poured in it have an exit point. This weekend I sealed it with some Thompson’s Clear water sealer that I purchased from Home Depot . I always attach that (above)Rust-oleum sprayer to my aerosol cans when I’m spray painting and it worked beautifully with this Thompson’s water sealer can. After the sealant was dry, I poured the sand in. I only used 7 bags since I wanted to be able to readily push the sandbox when it’s filled with sand (gotta be careful since I’m preggo). If you noticed too, I have the sandbox on our screened in porch. It’s way too hot here to place it outside; Zion would never be able to use it if it were outside. Imagine that, right ? But it has been that kind of summer where we’ve spent more time indoors instead of out. I barely emptied the last bag of sand before Zion climbed into the sandbox and started to enjoy. I am really pleased with it especially because he can be “almost outside” doing a fun activity instead of being stuck inside all day hiding from the heat. It looks brilliant - and how lovely that your friend was able to finish it off for you with your husband away. Aren't friends wonderful? I bet baby Z will spend hours and hours and hours happily playing in that! WHAT A WONDERFUL IDEA DEAREST! AND...I love his name! Always known as Baby Z., I never really wondered his name, but my goodness, what a majestic moniker for such a beautiful boy....playing in his sandbox. GREAT ROOM AS WELL TO ENJOY the fresh air, but staying CLOSE to mum! I hope that each day is filled with peace my friend. Do you know when the MISTA is coming home? Aw, this is so cool! I bet he simply loves it! Oh my goodness ! What an amazing thing. I wish I had been so clever when my own boys were sand box age. Lucky Zion! Wonderful!What a a great way for him to be on the porch where its cooler and still enjoy the sandbox! This is just amazing you did a wonderful job! I love that it's on wheels too! Zion is one lucky boy! This is SO COOL!!!! I'm sure he is beyond thrilled. That's such a fantastic idea!! I built one for Luke at our summer house stuck to a barn wall...needless to say it has never been used!! this is awesome! It's just great! That last photo is so sweet it kind of made me tear up a little. oh my gosh, Stacey, that boy is GROWING! I cannot believe how big he is. I think the last pictures you posted on here he looked like a little toddler. He looks like a kid now! Such a handsome little man. Excellent Stacey!! You're a lady who completes what she starts. Now, if you weren't expecting, I'd insist that you paint it! A bright red, or maybe little boy electric blue. But I'm sure Zee doesn't care, does he? Ooops. Just finished reading that you've used a sealer, so painting is out. Again, does the baby care? I think NOT. What a great idea Stacey and it looks like so much fun! How cute Zion didn't hesitate to climb in and start having a good time. Very smart of you keeping it in the shade since sand can heat up sp quickly. Have a wonderful week! Saving these images for baby Will due in September...love the sandbox on wheels!! Great idea. Your son can be busy and you can be happy he's safe in his sand box. Sometimes a good idea is all that's needed isn't it? 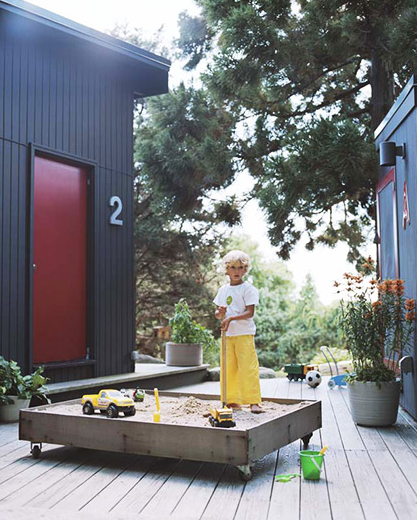 What a great idea our kids would love a sandbox although we dont get enough nice weather here in blighty for it to be outside much :( would have to convert the shed! What a wonderful idea! This is so perfect!!! That is such a fun idea, I love it! amazing, you did a wonderful job! Ok my friend, this makes my wooden toy crate on casters look pretty mediocre!!!! Good hearing from you. We are on vacation in Oregon, rolling in the sand dunes. I will be a better blog friend when I am back - with tons of vitamin D in my body! what an awesome idea Stacey. I never even knew these existed. I think Ariyana would love this..maybe I can convince my parents in NC to add this to their newly expanded deck! How perfect is a sandbox on wheels??? Brilliantly done, Stacey! Wish I had thought of this when my boys were in their sand box days!! What kind of holes are small enough to let water out yet not sand?